Yesterday I was lucky enough to attend Save the Harbor's Staff Day adventure to Spectacle Island and experience my first trip out on Boston Harbor! 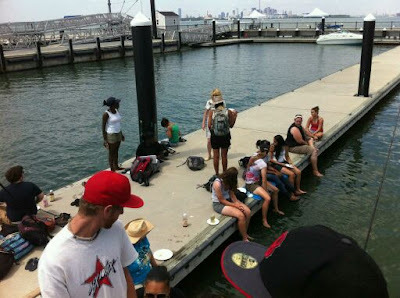 The Long Wharf dock was sweltering as we all lined up to board Boston's Best Cruises. I think everyone was anxious to escape the city heat. Our ferry ride in itself was an adventure! We saw police boats patroling the harbor and passed by the Deer Island plant up close. The boat first dropped passengers off at Georges Island, which I definitely didn't have a problem with, as we got to be on the boat longer! It was full of beach-goers and island explorers even though it was only 11 AM! 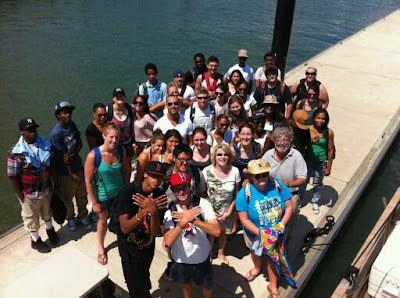 The staff then arrived at Spectacle Island where Bruce and Patty were waiting on the docks with their boat, Verandah, with a delicious lunch for everyone. We were treated to hot dogs, "chicken dogs" (which I had never seen before), sea bass salad (courtesy of a sea bass caught by one of the staffers earlier in teh week! ), carrots and hummus, and Cape Cod chips. I think we went through three rounds of hot dogs before everyone was full! For dessert, we enjoyed grapes, strawberries, and chocolate chip cookies. Patty even gave me a tour of their boat before they had to depart. Afterward, the staff split into two groups, one of which went to play an annual game of Capture the Flag while the rest of us enjoyed the perfect beach day! Sheuli dove right in the water and, as Annie said, "just bobbed around like a little seal". Caitlin, Stacey, Matt, and Cassie joined us. Cassie dove right in, too; Caitlin and Matt were a little surprised when the ferry wakes rolled in and soaked them up to their waists. It was a fun, fantastic day!